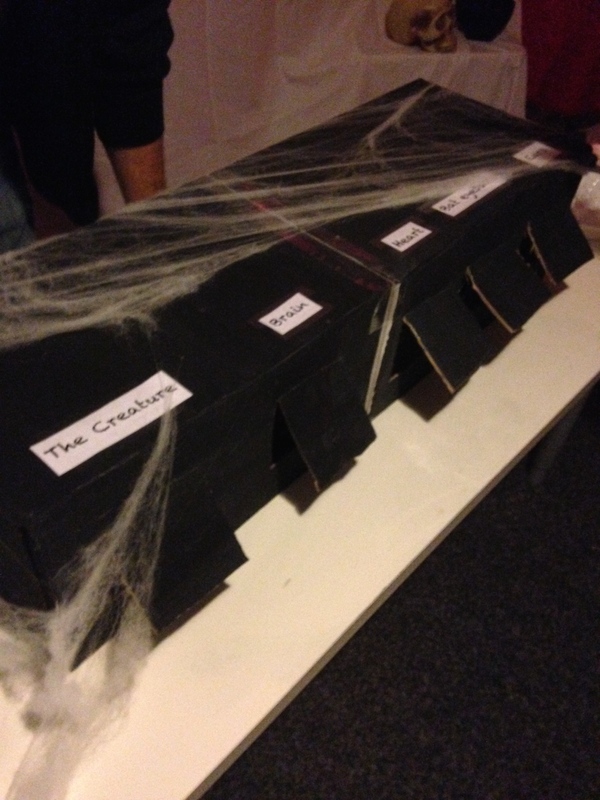 The Hall of Spiders came out really well. We divided the basement into rooms using sheets we picked up at Goodwill. 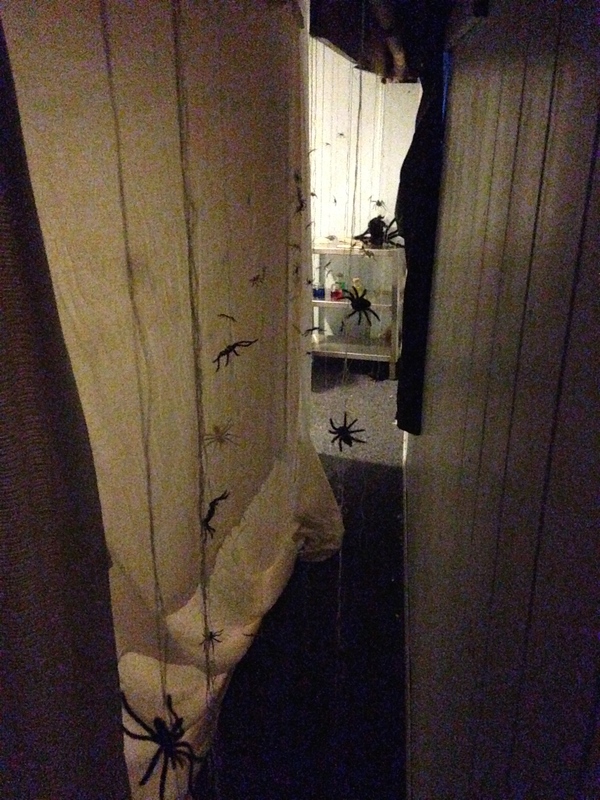 Then I tied about 80 plastic spiders to dental floss and hung them from the ceiling. The result was that when you walked through, the dental floss caught on your neck and shoulders, and it really felt like walking through spider webs. 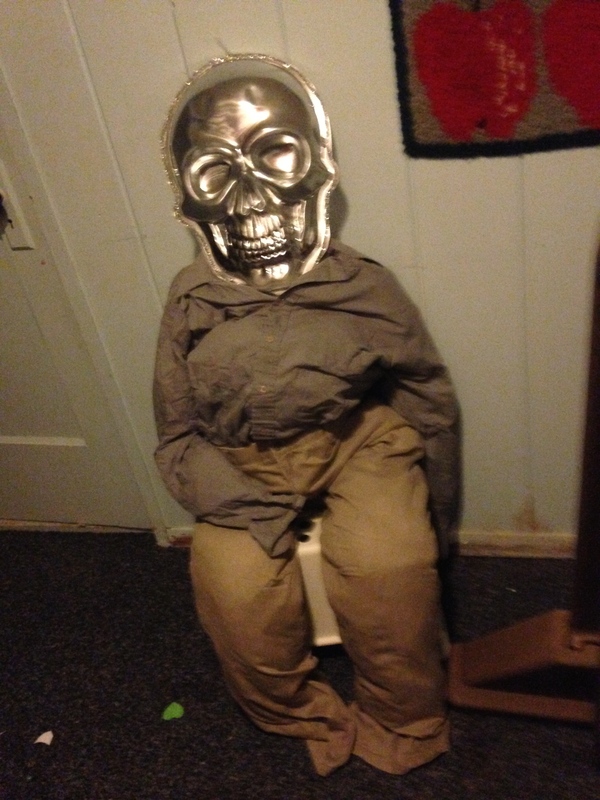 I was pretty proud of this ghoul, made from some of KPD’s old clothes stuffed with rags. 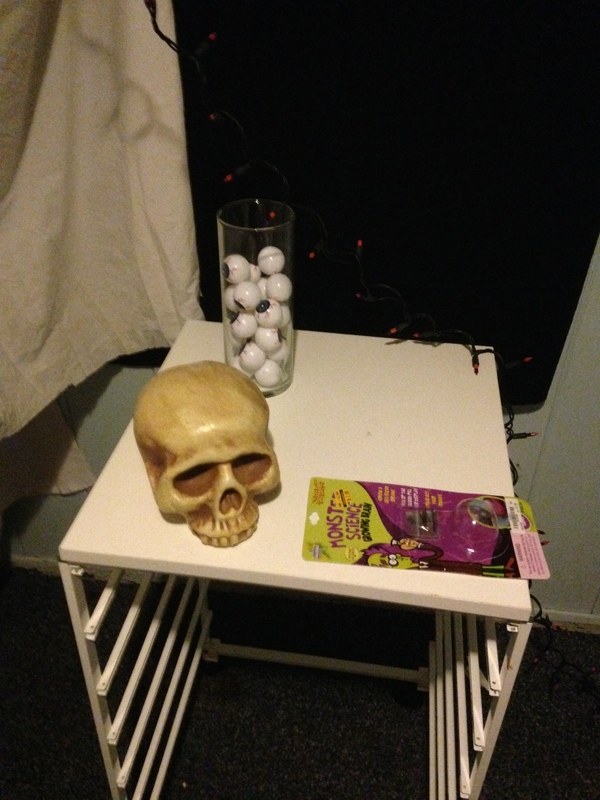 And we had some other items from the Halloween store that we used for set dressing. 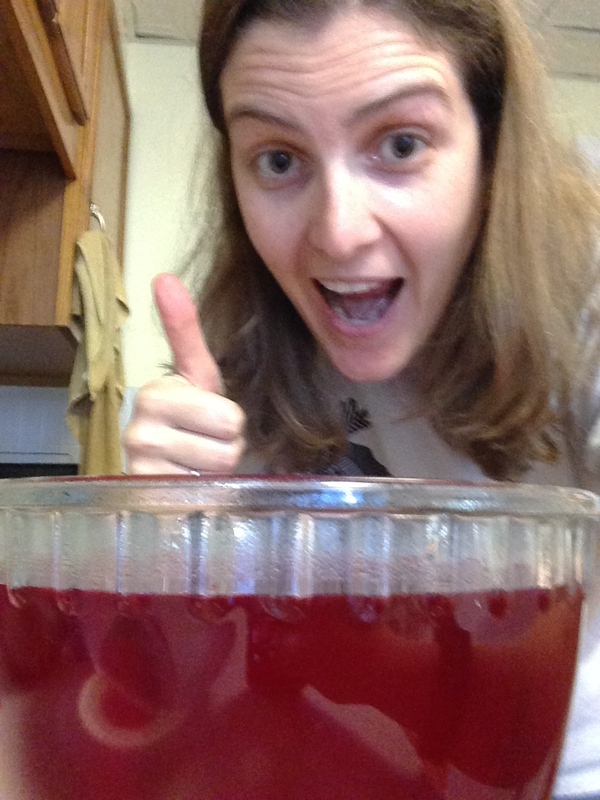 The eyeballs were covered with Jell-o on the day. Finally, we had our touch items. KPD made these boxes that the kids could reach into if they wanted to touch. From right to left (in the order of touching) we had ears (dried apricots), bat eyeballs (see below), a heart (peeled tomato–it really did feel like a heart to me), a brain (molded tofu that we carved, froze, defrosted, and covered in Jell-o), and The Creature. The Creature was my dad’s hand, which he inserted through the back of the box. When the children touched his hand, he would suddenly grab them. 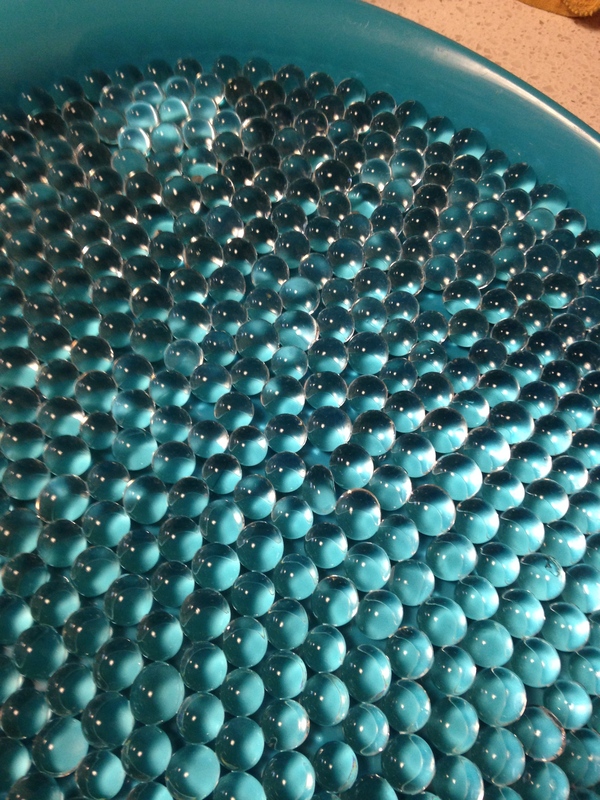 The eyeballs were an amazing product that we found at Marbles. 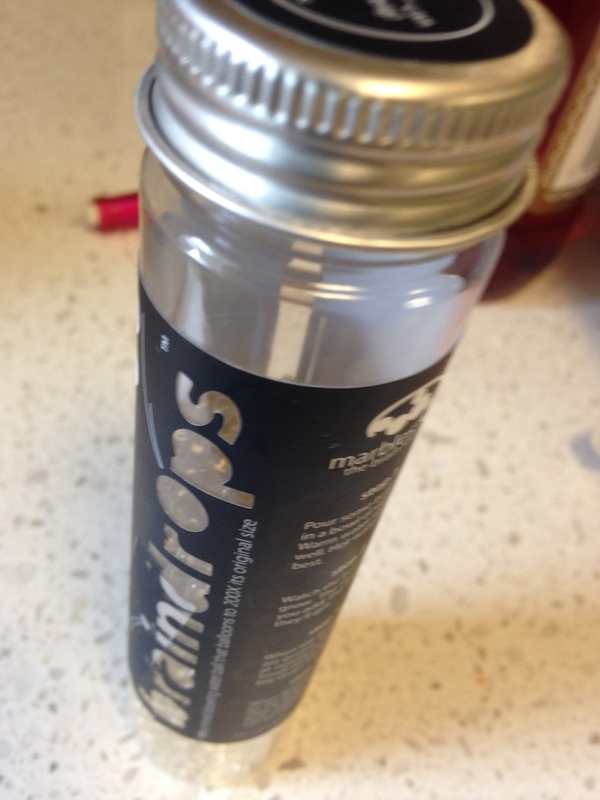 They’re called Braindrops, and they come in a small container. When you add water, they expand. They feel like eyeballs (I think) and they’re a lot of fun to play with. I made WAY too many of them on the day, and I’ve been fascinated watching them shrink slowly over the week. It’s not her best work, but the girls had fun with paints and Duck Tape and stickers. 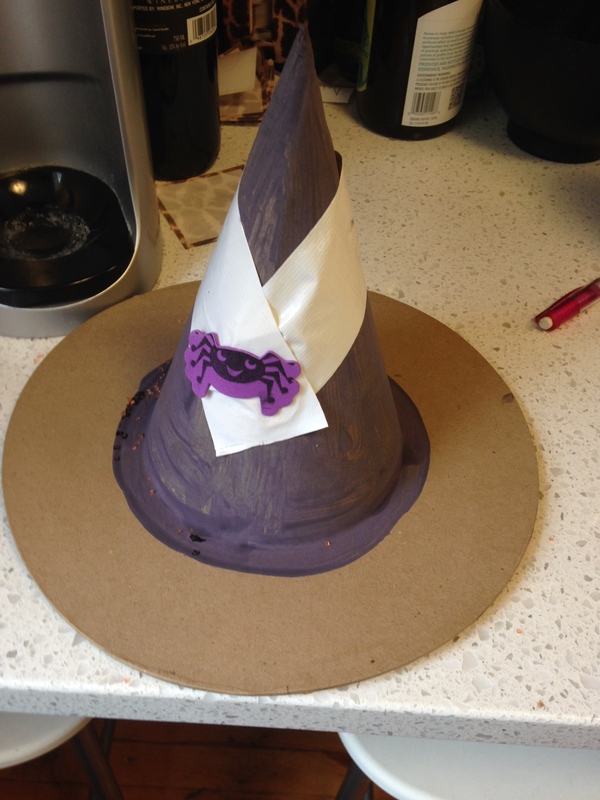 They also decorated cupcakes with Halloween decorations and white, orange and purple frosting. Their favorite activity, though, was the ghost hunt. Unfortunately, I don’t have any pictures that don’t include faces, but I cut eleven ghosts (since Kid turned 11) out of tissue paper and put a loop of dental floss on each. Then I hung them around the park outside our house, and the kids ran around and looked for them. Interestingly, I did this because last year we had a Harry Potter themed party and did a scavenger hunt with clues outside, which was also popular. But when I asked Kid if she liked the ghost hunt, she said it was better than the scavenger hunt because most of the kids don’t live in the neighborhood, and the clues were hard to figure out if you didn’t know the park well. However, looking for ghosts was an equal opportunity activity, and the girls from other towns felt more included this year than last year. 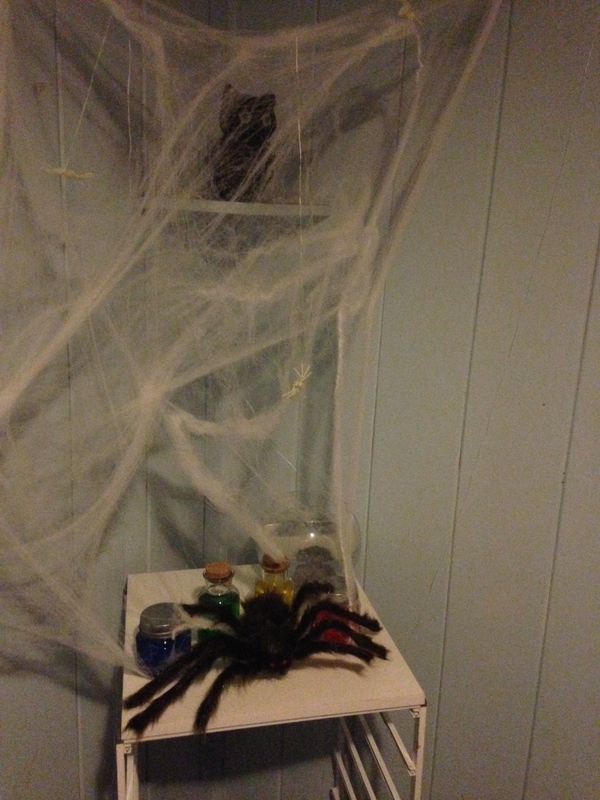 All in all, the party was a success, I’m finally recovering from last weekend, and I wish you all a happy Halloween! That looks awesome! Great job.